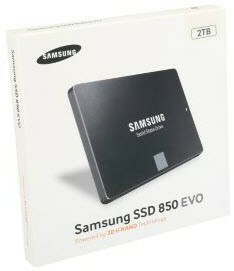 See various capacities and current Samsung SSD 850 EVO pricing at Amazon. But its fate was to be my "daily driver." Used and abused all day and much of the evening. The same Windows 10 install is booted natively some days in my laptop, and other times, as an ESXi 6 Windows 10 VM in my SuperServer Workstation. 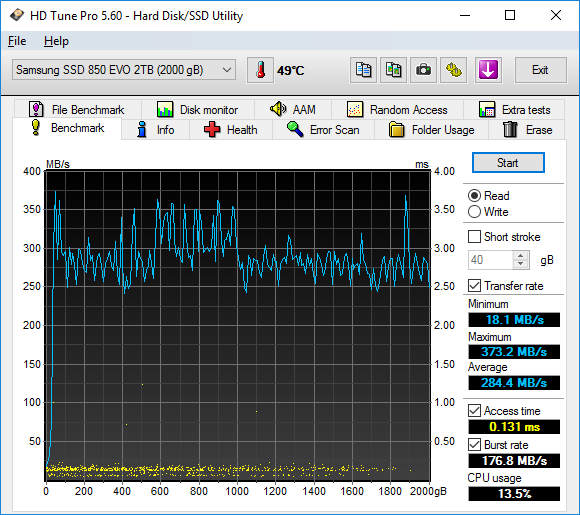 Samsung SSD 850 EVO 2TB 2.5"
Now, 6 months of happy ownership later, I figured it was time to check in on its performance again, having been bitten by some Samsung 840 PRO mSATA performance problems in the past. So I booted my 850 EVO back up on a ThinkPad W520 laptop that I call tZilla. Luckily, things turned out pretty well, again, with Samsung improving the ownership experience. Today, Saturday, is a great day for housekeeping, since the demands of work are less likely to get in the way should something go a little sideways. Earlier this week, when doing some Samsung 950 PRO NVMe Windows driver updates recently, I noticed that Samsung Magician 4.9.5 had been released. So I installed 4.9.5 on this W520 too, and it suggested the new firmware EMT02B6Q, since I was still back at EMT01B6Q. To prepare to upgrade and minimize risk, I first made sure I had a complete system backup using Veeam Endpoint Backup FREE, and made sure my SSD wasn't more than 90% full. I then ran some quick checks on performance to get some baselines, for a simple before-and-after comparison. Finally, I fired up the Camtasia video recording, just in case something interesting happened. Turns out I'm glad I did! Run some benchmarks, upgrade firmware and shutdown, boot Windows 10 back up, run some benchmarks again. Many observations made and lessons learned. Backup first, as is always a good idea, especially when doing firmware upgrades to your boot drive. If you're upgrading your Samsung 850 EVO, you may want to leave your system alone for a while after the upgrade, since there's a noticeable performance impact and some elevated drives temps right after the firmware upgrade shutdown/power up, when Windows 10 Defrag kicks off a rather lengthly background TRIM operation of some sort, likely keeping the SSD's controller busy. The duration of the degradation seems to be about 1 hour per TB of capacity, so for me, that meant about 2 hours of performance degradation. It appears both read and write speeds went up quite a bit at the crucial 4K size, and the overall average speed improved by roughly 18%, evident in the screenshots below, taken from video playback. I cannot really determine if the firmware or the new TRIM optimizations are what sped things up here, only time will tell if these speeds remain the same over time. This drive is about 85% full, also pictured below. BEFORE - ATTO Disk Benchmark at firmware EMT01B6Q. 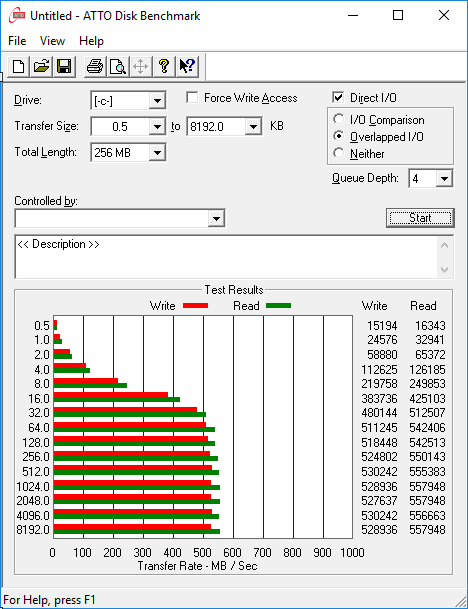 Note the speeds at the most noticeable 4K size - 143,739 MB/sec reads, 197,705 MB/sec writes. AFTER - ATTO Disk Benchmark at firmware EMT02B6Q. Note the speeds at the most noticeable 4K size - 216,686 MB/sec reads, 247,406 MB/sec writes. Like the [Samsung 950 PRO]'s Dynamic Thermal Throttling Protection technology, the 850 PRO's has Dynamic Thermal Guard. speeds have apparently gotten even better, with average reading of 227 MB/sec before the firmware upgrade and average readings around 326 MB/sec after. That's about a 30% speed boost! I can't really conclude anything else from this experience, other than to say that the temperatures I ran these tests at may have affected the initial findings, or that I merely should have waited longer before re-testing. Either way, one thing is for sure: I'm happy with this EMT02B6Q firmware so far. I'm also glad to have recorded the results, so now I easily retest in the months ahead, to determine whether those speeds have kept up. Your tests may only be very roughly like mine. More important is the comparison between before and after on your system, with your settings. Let us all know how the firmware upgrade goes on your 850 EVO by dropping a comment below. 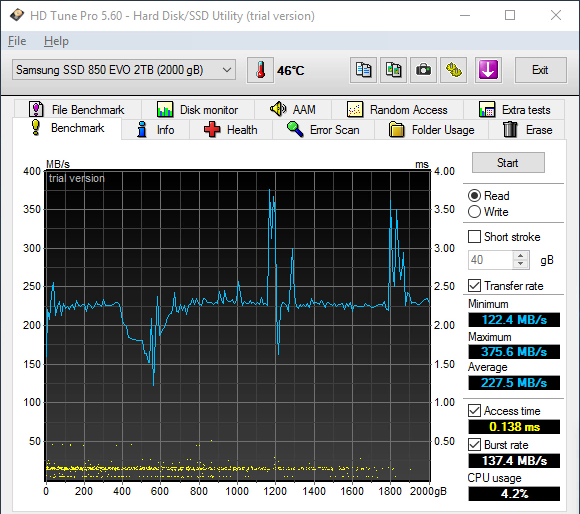 AFTER - A few days later, I ran HD Tune Pro again, 47C before and after the run. Performance is now considerably higher, 293.9 MB/sec minimum. Average 330.5 MB/sec. AFTER - Two minutes later, I ran HD Tune Pro again, still at 47C, and consistent performance demonstrated, with 288.7 MB/sec minimum. Average is 321.3 MB/sec. AFTER - Two minutes later, I ran HD Tune Pro again, now at 50C, and consistent performance demonstrated, with 269.9 MB/sec minimum. Average is 325.4 MB/sec. Nope, it's not the temps. Ran ATTO and HD Tune a couple of times, at the same time, to heat that 850 EVO right up. Once I passed 55C, the Windows 10 popup warnings (that I mentioned earlier) came up again. At 56C, the HD Tune Pro benchmark still finishes up just fine, with good speeds, seen below. AFTER - Another day later, ran HD Tune Pro again, now at 56C, yet consistent performance still demonstrated, with 284.4 MB/sec minimum. Average is 314.7 MB/sec. AFTER - A few minutes later, at 49C, with 285.0 MB/sec minimum. Average is 334.8 MB/sec. Note, I went ahead and bought, then licensed, my HD Tune Pro 5.60. I had recently noticed my performance has dropped, just didn't have a chance to do much about it yet. Things like suspending and resuming a large VM that I use daily, where all 8GB of RAM gets swapped out, then back in again. Yesterday, along came this comment by Alex9. The net of the dialogue is that I don't know if my recent mishap where I accidentally filled the C: drive to 100% capacity during a large file copy operation caused my recent performance drop. Running TRIM (through Windows defrag) didn't help. More actions to remediate will be taken, then I'll add an update to this article. 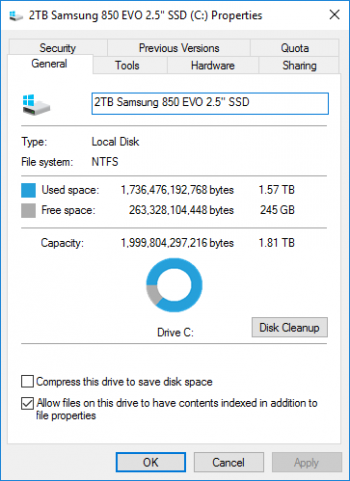 July 19, 2016, a few days after this 2TB C drive was accidentally filled to 100%. Run 1 of 2. July 19, 2016. Run 2 of 2. How do I update firmware in DOS mode? / How do I make a Bootable USB Disk? / How do I make a Bootable CD/DVD?